tangible T4 Editor 2.0 plus modeling tools – Released! We just released the second generation of our tangible T4 Editor. Version 2.0 marks a big milestone for us. We have been working on this major release almost two years. This effort was done in parallel to the many Version 1.x updates and smaller feature improvements we shipped over the period of last 3 years T4 Editor Version 1.x exists. tangible T4 Editor 2.0 is almost a 100% rewrite of the existing Version 1.0 product. It addresses nearly all feedback we got from you regarding feature wishes and change requests. Thank you for providing feedback in the past – we really read every piece of feedback and take action on it. Support for VS2010 and VS11 (Beta) – Following the tradition from 1.x we will support two Visual Studio Versions in 2.x. tangible T4 2.x will be supported for VS2010 and VS11 (Beta). We have two separate installs. We use the real Visual Studio Code Editor: This now honors Tab Settings, Keybindings, UTF-8 Encoding, Version Control System Integration, Fonts and Colors, VS Search Dialog, Support for VS Editor Extensions like Incremental Search and Current Line Highlighting. Support for Dark Theme – Note you can customize the T4 Code Highlighting Color under Visual Studio Menu Tools->Options->Environment->Fonts & Colors ->”tangible T4 Background”. You can customize the other colors and fonts also via this Fonts & Colors dialog. New Statement-Completion within T4 Code Blocks behavior that corresponds to VS 2010 Editor behavior. Also completely new Parsers that now support newer C# and VB Language features. Also changed from generating Warnings about limitations of Free Edition to show up in Completion List instead in Error Window. Additional Directives to solve VS T4 Engine limitations: #includeForIntelliSenseOnly, #assemblyForIntelliSenseOnly, #newappdomain, #IntellisenseLanguage directives. Remaining Incompatibility with some ASP.NET MVC Builds should be fully resolved now. Debugging Support - two new features: Quick Debug with Preview and Debug in separate Visual Studio instance: Allows you to run your templates in a debugger and also see the generated output while the debugging is performed. 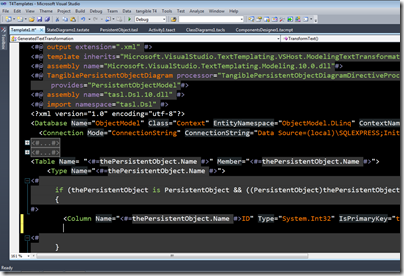 New Statement-Completion within T4 Code Blocks behavior that corresponds to VS 2010 Editor behavior. Also completely new Parsers that now support newer C# and VB Language features. Transform on Build feature was improved and allows you to transform specific templates each time you hit the Build Project Button or F5. Navigation via Class/Member-Dropdown also to classes and members from included files. You can review the complete list of features and improvements of tangible T4 Editor 2.0 plus modeling tools here. You can use T4 Editor Free Edition as before. There no restrictions that prevent using it in commercial or private projects. Please read the EULA for the actual use rights. As tangible T4 Editor 2.x targets both VS2010 and VS2011 and it is a complete rewrite, added significant features it is considered a major upgrade which is reflected by the version number. The license typically comes with 12 months updates and support builds of 2.x version for both VS2011 and VS2012. You will need a 2.x Activation Key to activate the Pro Version. You can order a license via our web shop. As this new Version is a major upgrade (not update) which allows you to use the product even with VS 11, adds significant features and is a complete rewrite we need to charge you for upgrading. If you did not renew your support subscription and it timed out you need to buy the full 2.x version as if you were a new customer. Note that the price changed from USD to EUR as we are based in Germany. [EUR 35.00] Upgrade Only from Version 1.x to tangible T4 Editor Version 2.0 plus modeling tools for VS2010/VS11. If you bought T4 Editor 1.x within the last year you can upgrade to 2.x for a small fee of 35 EUR which approximately corresponds to the price difference of 1.x and 2.x (See above). Note this offer will NOT extend your support period. If you also want to extend support you should take the next order. This is the default option you should take if you want to upgrade. This assumes you have an active support subscription and you want to also extend it by 12 months. We have put a new product website online please make sure you get a fresh new design. If you get the old site please clear your Browser Cache and DNS-Cache. If you have any comment or feedback about the product and specially the new VS 11 Beta Support please do not hesitate to send us an email at support@tangible-engineering.com.